West Ham have taken up their option to sign on-loan Argentine midfielder Manuel Lanzini permanently from United Arab Emirates club Al Jazira. The 23-year-old, on a season-long loan at the Hammers, has signed a four-year deal, joining for an undisclosed fee. 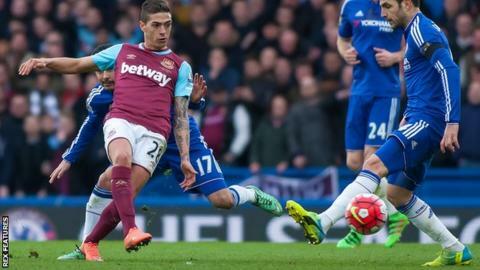 "I really feel at home here, and when you feel at home somewhere, you definitely don't want to leave," Lanzini told West Ham TV. "I am very happy and what I want to do is to keep giving the best of myself." The contract starts on 1 July and it is understood there is the option of a further two years. The Argentine has scored five goals in 18 league matches, including one in the 2-2 draw with Chelsea on Saturday. Boss Slaven Bilic has now secured the futures of three of his key players after Dimitri Payet and Cheikhou Kouyate recently signed new long-term contracts.